Honda’s Matt Neal completed a memorable afternoon for the Japanese marque as the triple champion claimed the second victory for the new Civic Type R, following team-mate Gordon Shedden’s thrilling race two win earlier in the day. The finale got off to a dramatic start when Rob Collard’s BMW was tapped into the gravel at Paddock Hill Bend, whilst a quartet of runners further down the field made contact at Druids. The first safety car of the season was immediately deployed as Josh Cook’s Chevrolet and Warren Scott’s VW were also forced into retirement. Pole-sitter Rob Austin remained out front in his Exocet AlcoSense Audi but the two-time race winner couldn’t shake off the attentions of Neal and the MG of the impressive Jack Goff. The top three pulled away following the restart as Sam Tordoff’s kept a trail of cars behind him in fourth. 2013 champion Andrew Jordan was busy having his best showing of the day on his MG debut, as he scythed his way by Tom Ingram’s Toyota and Tordoff’s BMW to grab fourth on lap 15. Aron Smith was cutting his own similar ascent through the pack and eventually followed Jordan through and into fifth. There would be changes aplenty in the top order, however, as race-leader Austin struggled for pace late on. Neal made his move on lap 21, and was immediately followed through by Goff at Paddock, as Austin was unable to withstand the race-long pressure. Jordan was soon upon the Audi too but a mistimed attack on the approach to Clearways led to contact, with both cars scampering across the gravel. Austin recovered and went on to claim fifth while Jordan retired in the pits with a puncture. Goff kept Neal honest throughout and although they couldn’t match the incredible closeness of the race two finish, the gap across the line of just 0.196s again went to show the ultra competitiveness of the BTCC. Smith, Tordoff and Austin were next up on the timesheets while Ingram rounded off a solid opening day with a top six result. Adam Morgan’s Mercedes took seventh ahead of the charging Andy Priaulx, who made the most of last corner contact between Dave Newsham’s Chevrolet and Hunter Abbott’s Audi to claim eighth. Former champions Colin Turkington, Jason Plato and Shedden all endured disappointing results for differing reasons. Turkington spun his VW at Surtees and could only recover to finish 12th while his team-mate Plato had his storm through the field halted by a power steering problem. 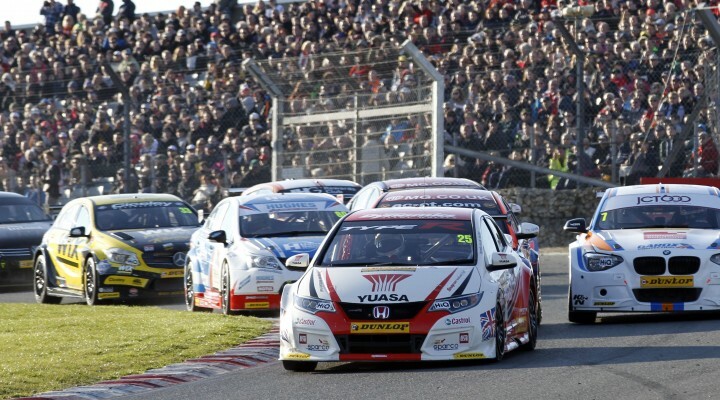 He was able to finish the race, albeit way down the order, while Shedden’s Honda did not make the final classification after a mid-race pit stop to correct his own mechanical woes. Click here for the full classification from race three.